Get to know your sewing machine and use it as a drawing tool to create individual designs. As a freelance tutor and lecturer, I travel nationally and internationally, visiting groups and guilds. Join me on a creative adventure to explore the wonderful world of block printing in Jaipur along with the textiles of India. Inspired by the theme ‘Looking Through’ this course will encourage you to experiment with a variety of techniques, Including piecing, patching and layering, fabric painting and printing and freehand machine embroidery. You will then develop an individual piece of work. Design sources could include looking through windows, arches, doorways, portholes, trees, foliage, microscopes, telescopes etc. and the Amex Stadium. 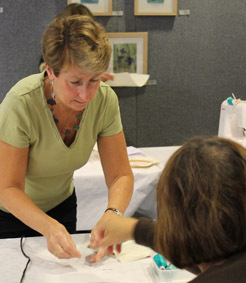 Enjoy a week of creative stitching. Free parking. forests and low mountains of the Monts D’Ambazac. Explore the textures of the landscape and create your own individual design. This course is designed for students who have attended the beginners’ course or equivalent. and offer the following selection of titles. Layer, Paint and Stitch - Exploring the techniques and ideas in my book.